As the development fund is growing and possibly soon the Blender Institute will direct its attention to better Snap and precision modeling tools, I could not contain myself and I decided to make a list of the resources that could be implemented. The original list was reviewed by Paul Kotelevets (1D_Inc) - concept designer of 1D_Scripts toolset. It is organized into three categories of importance. PRIORITIZED ITEMS; ITEMS FOR SECOND EVALUATION; and QUESTIONABLE ITEMS. 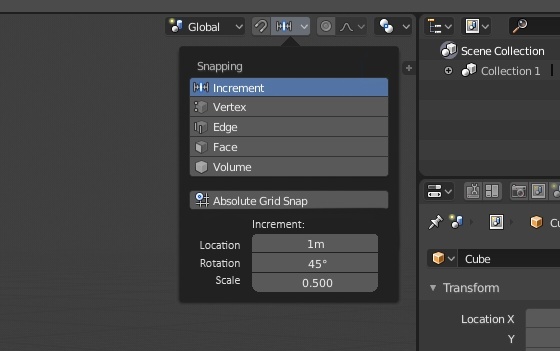 Currently this option only works to merge vertices, but it would be a good addition to also split and merge an edge, since it currently takes many steps to achieve the same result. When a point is moved to a specific direction and the snap point is performed on an edge or face, the final snap should be made at the intersection of the direction vector with the face or the edge. Currently the final snap is performed on the point closest to the current position pointed by the mouse cursor on the edge or face. 1.4 - Transform tools performed over a base point. This feature would only be available if the snap is enabled. Since in Blender 2.80 we have the support of Gizmos in the tool system, it would be good to indicate and allow the user to choose more intuitively where the "Target" (motion pivot) starts. Currently, the user has to click on a random point of the screen to perform the transform. And the "Target" is set along with the snap options in an unmanageable way. This will also take advantage of the new Middle and Perpendicular options. However, for the knife, the snap options for edges and vertices will always be enabled in this tool to avoid discontentment due to muscle memory of long-term users. 1.5 - Snap for edge and vertex slide. Generally you are not sure which grid point the object is in the perspective view because you need to consider the current depth of the object on the screen. Basically, axis/plane restriction is property of entire snapping system depending on view mode. The current issue that prevents adding this feature is conflict with the keymaps. The incremental Snap is made on a kind of grid with offset and not over the distance from the origin point. 3.3 - Keymap ability to Switch GX and GXX order because local transforms are used more often in a wide range of applications, such as historic restoration. I think the snap to edge behavior for rotations needs to be completely redone, basically. You snap to whatever point on the edge is closest to your cursor at any given moment, which isn’t actually useful for anything. What you want is to snap to the point on the edge where the rotation brings your selection closest. You would want to snap to the point where the vertex is actually aligned with the edge. Those snap proposals looks great though! in fact, more than the nurbs, a visual feedback system would be needed to manage the “surfaces” and “segments” … a manipulation technique similar to that of moi 3D and obviously as a result tools similar to moi itself … in a sort of " fake nurbs edit mode ". There is already a couple of addon that uses splines to make surfaces with curves similar to modeling via nurbs. 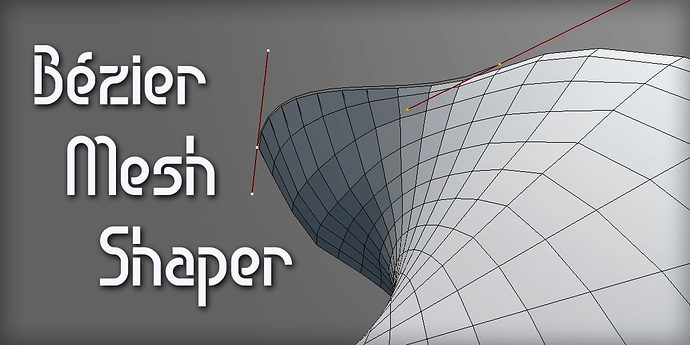 Quickly create and configure mesh surfaces from bezier curves. one panel for viewing the 3d result only. after drawing we use another drawing to give the third dimension to part of the mesh. we can easily join mesh parts … with or without constrains. we can join mesh with another. the implementation might be in the 2d template from file --> new – menu item. Remembering that these changes would be an early step (to solve the immediate problem). Nurbs will benefit from these changes. I agree that the snap on the rotate operator needs attention. But I think the idea of choosing a base point would be a good start before we propose new solutions. it seems like a great start! This is off the topic of what I’m saying Blender is badly in need of. Believe me I would love for BREPs to be natively supported. A STEP importer would be nice,too. Because that would mean I could fully ditch Autodesk products, but that’s not what I’m really looking for here. I want a way to quickly place, rotate, and scale an object with enough precision that it is quick easy to make renderings of mechanical components and architecture, for instance, without a lot of headache. It is an achingly absent feature of Blender. One that isn’t missing from any other rendering software I’ve used in the last 20 years. If I talked about “fake nurbs” there’s a reason, and I think it’s an excellent solution around the corner and it’s to create a visual representation of “fake nurbs” that are created and processed by tools and manipulators that build mesh surfaces that are very similar to the shapes of the nurbs surfaces but would always be modeling mesh. if I want to create a solid model this would be composed of so many “fake nurbs” surfaces (that are always mesh ) … the sense of all this would be to have the advantages of modeling nurbs made of Booleans,and trims operations (for this reason I wrote that they need better boolean) and modeling precision on mesh modeling. And I do not think it’s off-topic, otherwise what would you mean by “precision modeling”? 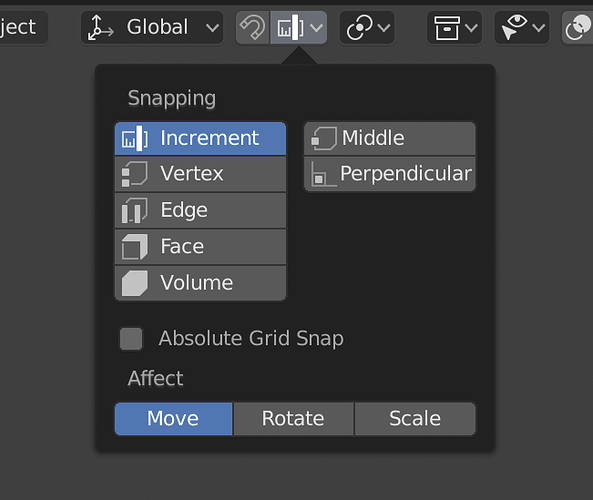 All these fancy (and no doubt useful) features are being discussed while you can’t even change the snap increments in blender! mauge is a member of Vimeo, the home for high quality videos and the people who love them.